A welcome update to an-already fine pedal. 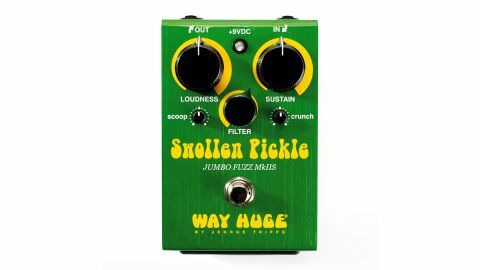 You may already be aware of the original Swollen Pickle, and this MkIIS offers a similar fuzz in a more 'board-friendly footprint. Its controls are extremely powerful, allowing you to achieve a vast array of fuzz tones - from subtle warmth to face-melting filth. This Pickle also features two internal pots labelled Clip and Voice. Clip gives you the option of a smooth warm fuzz all the way up to an massive sustained fuzz, whereas Voice sets the intensity of the external scoop control. Besides the incredible versatility, we also love the practical addition of a convenient nine-volt battery door for easy access.